With our recent basil harvest (over a pound of just leaves! ), I'd made quite a bit of pesto. After seeing and hearing about various pesto pull apart breads, I thought I'd make some pesto bread too. However, I wanted something I could eat relatively neatly on the go. I thought about the swirl biscuits. 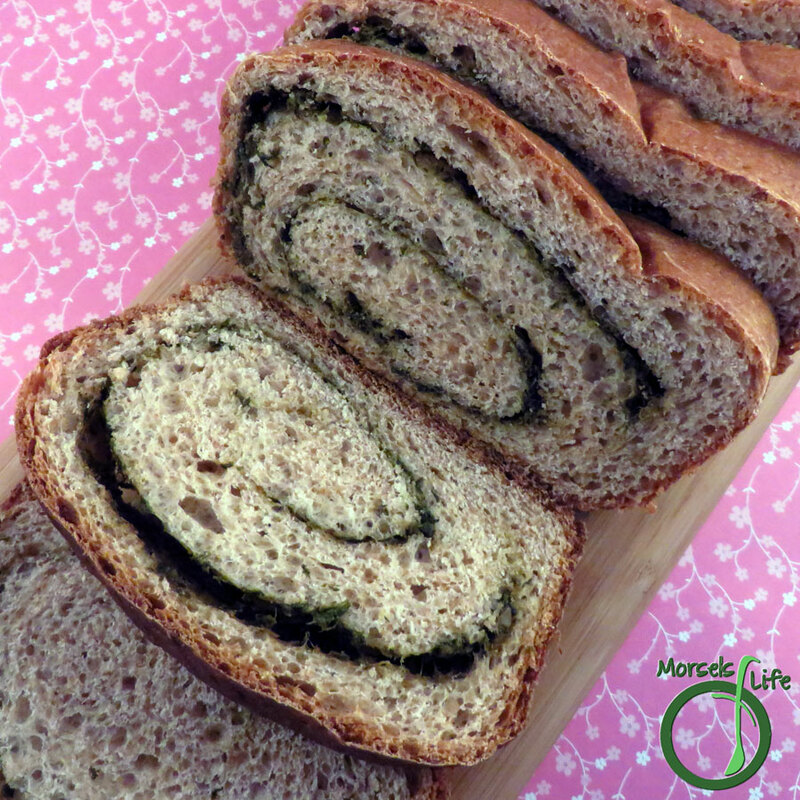 Why not make a pesto swirl bread? And thus, a recipe was born! You just take a basic bread recipe, and instead of forming it into a loaf, you roll it out and spread pesto on the inside. I used about 3/8 cup per loaf. Then, simply roll up the dough and place it in a loaf pan, seam side down, for the final rise. 45 minutes at 350F, and you'll surely smell the wondrous scent of pesto wafting through the air. 480 grams 4 cups flour I used half whole wheat and half white. 2. 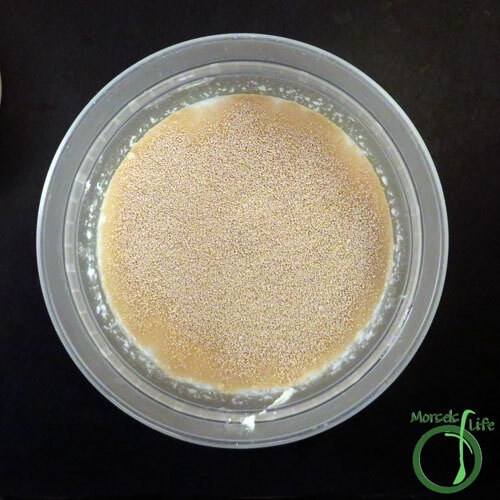 Sprinkle yeast over milk. 3. 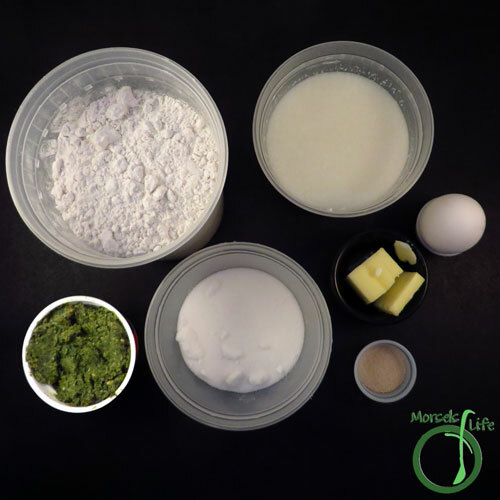 Combine all materials except pesto, and mix until dough formed. 4. 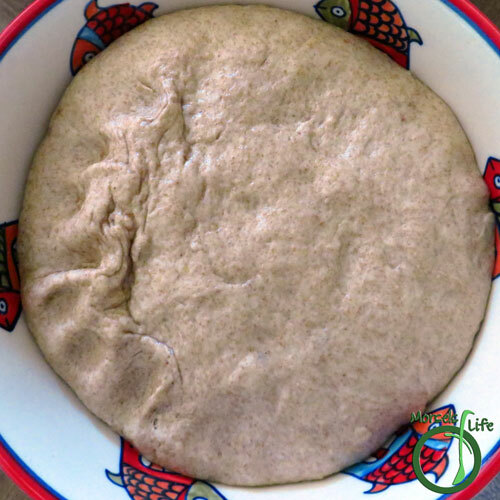 Allow dough to rise until doubled in volume. 5. 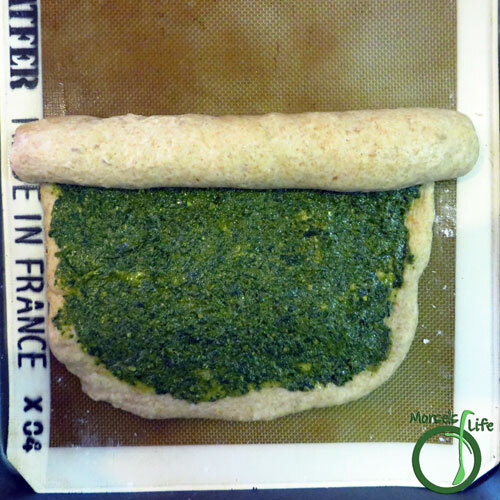 Gently roll out dough, and spread pesto on top, making sure to leave a small margin around the borders. 6. 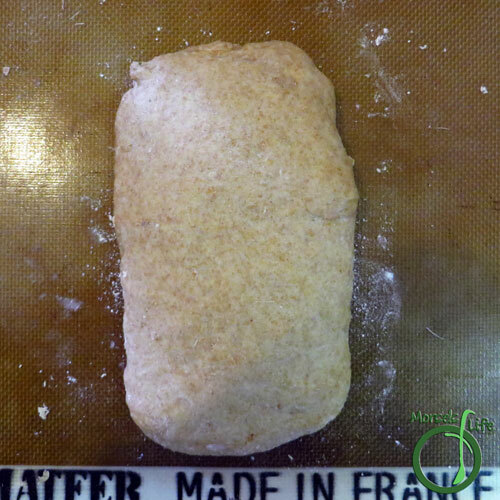 Roll up dough, and seal seam. Place seam side down, and bake at 350F for 45 minutes. What a great idea! Just think of a loaf of homemade pesto swirl bread served up with your favorite lasagna... oh or a big bowl of minestrone! Yum! Cool Idea! I will be making a eggless version of this now! Thanks for sharing - I am nominating you my favorite for Turn it up Tuesdays. This is amazing! Thanks for linking up with What's Cookin' Wednesday! Thanks for the nomination - I appreciate it! :) Let me know how your eggless version goes. With Bobert's egg allergy, I'm needing to make more things egg-free now. I love to bake bread - my specialty is sourdough. 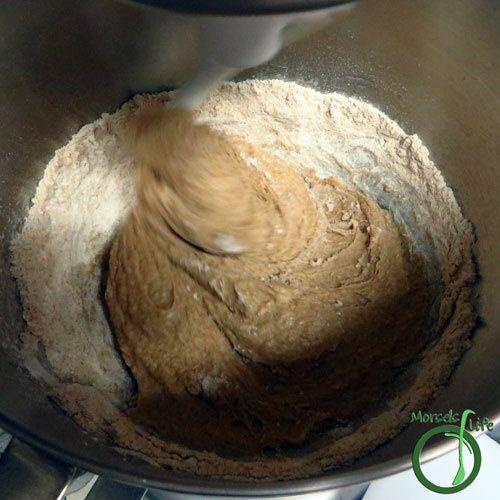 This is a great idea to add to a loaf of sourdough! I agree! 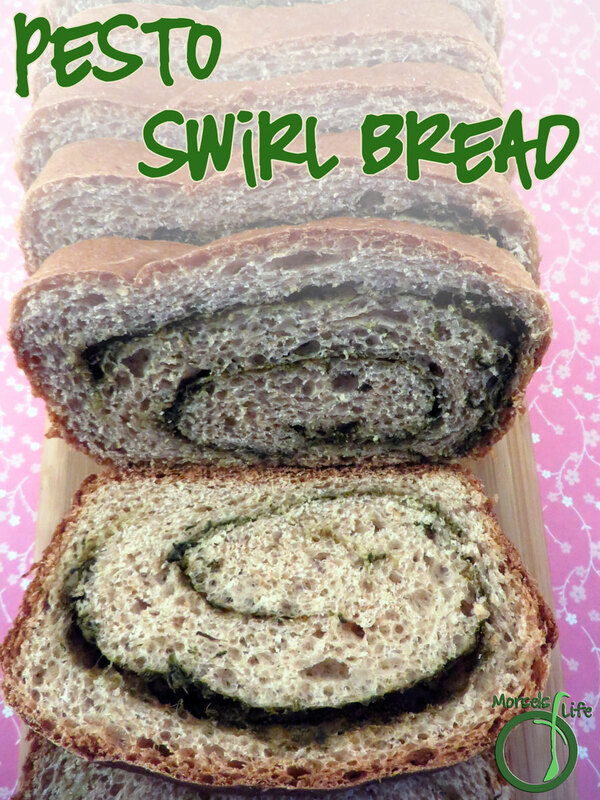 A pesto swirled sourdough sounds like something I need to try. :) Hope you enjoy! This sounds great and it's really pretty too! It would be a great gift, I think. Thanks so much for sharing at Inspiration Thursday! Thanks! 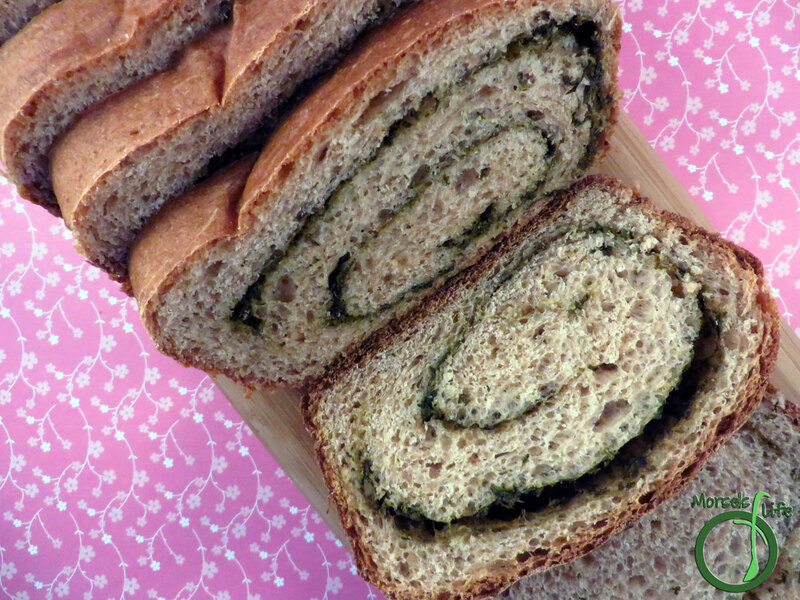 We've given this pesto swirl bread as a gift, and the best part is how nice it looks with just a little bit of effort. :) Hope you enjoy it!